I really love the Estes Big Daddy. It's a great kit - looks good and flys well on D and E size motors. My last Big Daddy had a number of flights on the Aerotech E18 reload & looked fantastic with it's big white flame. It's part of my regular fleet, despite suffering a CATO when the rear closure of the motor blew out. At Christmas time, I picked up another Big Daddy kit on Ebay with the aim of converting it to fly on 29mm motors - the H128 specifically! The kit sat, taunting me for months but I've now completed my upgrade!! This is the Really Big Daddy! I started by re-cutting the centering rings and fins in 3mm plywood - the fins are very slightly larger than original. 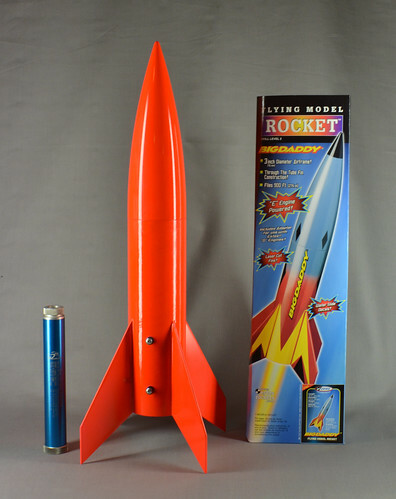 The launch lug has been swapped for rail buttons and I have also added 120g of lead shot in the tip of the nose cone. Rocksim predicts that this will fly to around 2800' on a H128 or about 2000' on a G64. I'm looking forward to launching this!